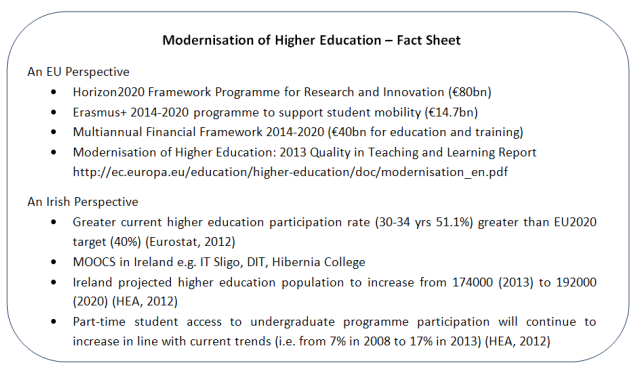 Irish higher education is undergoing fundamental structural reform at a national level, while engaging in an increasingly globalised market place. As we move towards 2020, issues concerning student participation, retention and resourcing sit alongside policy and practice tensions. However, the core issue of quality in higher education remains of paramount importance for all educational stakeholders. Address associated infrastructure, funding, policy, IPR, staff development and accreditation issues to support the adoption of these practices. ILTA welcomes the support and partnership of the EU DG Education and Culture in presenting this theme. This builds upon our previous collaboration in presenting the ‘Openining Up Education’ EU theme at EdTech2013. We are particularly honoured that Margaret Waters (Deputy Head of Unit – Higher Education and Erasmus) will represent the European Commission at EdTech2014 as we engage with this important theme.